Two Salina residents are picking up the pieces and looking for help in finding whoever was responsible for entering their home and stealing several belongings. Police Capt. 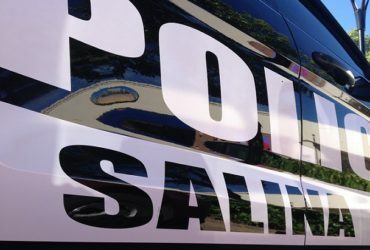 Paul Forrester tells KSAL News that the burglary occurred between 4:30 p.m. and 6 p.m. on Wednesday at 120 E. Prescott in Salina. The residence’s two occupants, Jordan Poague, 25, and Cierra Wilson, 24, both returned home at 6 p.m. and saw that their front door was open. When they went through their residence, they found that numerous belongings were missing including a PlayStation 4, Nintendo Switch, Google Chrome laptop and other miscellaneous items. During the investigation, authorities learned that the thief appeared to have had forced entry through the back door, damaging the door. The thief then exited through the front door, leaving it open. Total loss and damage is listed at $1,680. There are no suspects.